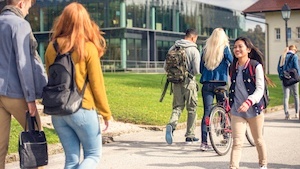 Summer may have just started, but it's not too early for college students to sort out their back-to-school living arrangements. The biggest question to resolve is whether to choose on- or off-campus housing. We've provided a list of the pros and cons of dormitories vs. apartments to help simplify your decision. Which option makes sense for you? What college student doesn't have to pinch pennies? You may be surprised to learn that apartment living can offer significant savings over on-campus housing. Dorms are priced at a flat rate, regardless of how many meals you skip or how much electricity you use. On the other hand, apartments give you a chance to control how much you spend on rent, food, utilities and other expenses. The flip side of saving money is assuming responsibility for preparing meals, paying bills and handling other duties that would be done for you in a dorm. Consider this a great opportunity to develop the skills required for independent living in a relatively low-stress situation. In many dorms, you have little or no choice over who you room with or how many roommates you have. If single rooms are available, they come at a premium rate. When you lease an apartment, all roommate options are up to you. Two? Three? Zero? You decide. And thanks to modern technology, there are a number of bill-splitting apps that make dividing the expenses relatively painless. Did you know that the average dorm room measures less than 130 square feet? And those rooms are generally designed to hold at least two occupants. In our Springs luxury apartment communities, even studio apartments feature more than four times the square footage of an average dorm room. We also offer the flexibility of one-, two- and three-bedroom floor plans to accommodate your needs. A college campus is a selectively focused environment, so there's always someone around and something to do. Since the demographics are limited, activities by definition will revolve around a specific age group with particular interests. When you live off-campus, you enjoy greater access to a wider range of people and activities for a well-rounded social life. The on-site management teams at our Springs luxury communities love to encourage interaction by holding resident events such as holiday parties and after-work get-togethers. It's heartbreaking to leave Fido or Fluffy behind as you head off to college. The fact is that most dorms restrict pets to small, confined animals such as fish and birds. At Springs, your dogs and cats are also valued residents. Our pet-friendly communities feature off-leash dog parks and pet spas for your convenience, and we welcome a number of non-traditional pets including ferrets, iguanas and hedgehogs. Our Springs apartment communities are conveniently located near college campuses in cities across the country. Stop in and visit with a member of our on-site management team to learn why "luxury living" during college is not an impossible dream!